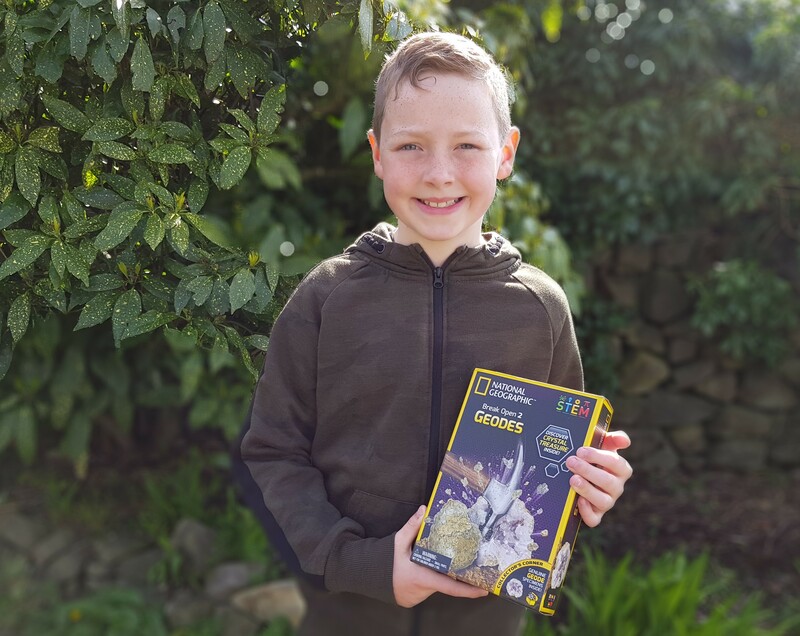 My youngest who is ten really enjoyed the Break Open 2 Geodes set from National Geographic. This was our second product as S.T.E.M Ambassadors for BANDAI. It kept him occupied for absolutely ages. He was hammering away determinedly trying to break into the geode. I think he found it quite a therapeutic activity. Plus, it was a fair workout by the end of it! A good way for children to burn off some energy. It does require patience though, especially if you want a nice clean break. You need to gradually split the geode ideally using a chisel to help you achieve this. Although if you want lots of little pieces you can just keep hammering away! At one point my son wanted to do that because he said it would feel like he had more crystals. But then he focused on the task at hand and decided he wanted to get a neat break. My son seemed to alternate between just the hammer and then periods of using the hammer and a chisel. Eventually he had a decent grove on his geode, and it was easier to break. It was so satisfying when the geode came apart in two halves. He was delighted when he could see the beautiful crystals inside. He felt quite proud of himself as he had stuck with it even though it took a fair while. We sped up the process by wedging the geode with rocks, so it was still whilst he hammered and chiseled away. I think if we had done that earlier we would have simplified the process. But it was all part of the learning process. The Break Open 2 Geodes set came with safety googles, which I recommend are always worn! Small bits of rock fly off which can be a bit dangerous otherwise. The set also comes with a little magnifying class so you can have a closer look at the rock once you discover those pretty crystals. You also get a simple stand to showcase one half of a geode. You will need your own hammer and chisel. As before with the National Geographic Dig Set this set is very educational too. You have a learning guide so you can understand how geodes are formed, where you are most likely to find them and the different types of geodes. It’s not a difficult activity to do you just have to be prepared that it can take time. But you can always leave your geode and come back to it later. We did this when his arm was aching from hammering! Priced at £9.99 I think I will be picking up some of these as birthday presents. They are such a useful resource and a great way to get your child interested in geology.